group and so on. The equipment should be grouped so a unit that works together is scheduled for the same PM group; for example, semitrailers with truck tractors, scrapers with tractors, and so on. Activities should assign each piece of equipment to one PM group initially. After the system is established and operating, the maintenance supervisor should review its effectiveness and REDUCE the intervals for high mileage/hour items of equipment, if necessary. The time interval is NEVER INCREASED beyond 40 working days. A preventive maintenance inspection schedule, such as the one shown in figure l-l, should be established annually. A new schedule is required each year, as the schedules are based on the workdays in each calendar year. The workdays on the schedule must correspond to the actual workdays of the unit; for example, if you work a 5-day week, enter 5 days; omit holidays. The PM groups are numbered vertically down the first column. Figure 1-1 shows the standard 40 PM group concept arranged for a 5-day workweek. The dates of the workdays of January are then listed consecutively in the January column. After the last workday in January is entered, continue with workdays in the February column and so forth. After completion, the schedule indicates the workdays that each PM group is due for inspection. For example, figure 1-1 shows PM group 5 is due on January 8, March 6, May 1, June 27, August 23, October 23, and December 19. The object of a maintenance inspection is to detect minor deficiencies before they develop into costly major repairs. This is done daily by the operator and regularly scheduled preventive maintenance. 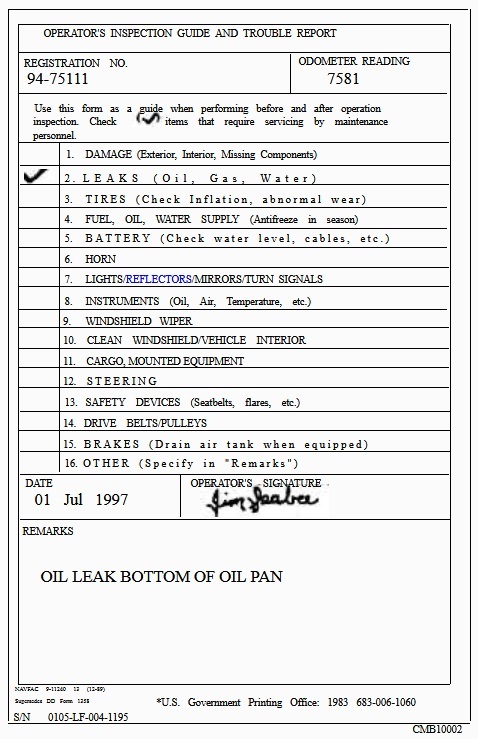 The first sign of vehicle trouble is usually detected by the operator during one of the three daily inspections: before, during, and after operation. The BEFORE OPERATION (prestart) inspection consists of an operator inspecting the items listed on the Operator's Inspection Guide and Trouble Report, NAVFAC 9-11240/13 (fig. 1-2). If a defect is discovered, the equipment SHOULD NOT BE OPERATED. The defect must be reported to the dispatcher who, in turn, will report it to the maintenance section. Figure 1-2. - Operator's Inspection Guide and Trouble Report, NAVFAC 9-11240/13. The DURING OPERATION inspection consists of an operator using the sense of smell, sight, and touch to detect improper operation. When a defect is discovered during operation, the equipment should be secured and the problem reported to either the supervisor or the dispatcher. The AFTER OPERATION (post operation) inspection consists of an operator looking over the equipment while performing established shutdown procedures and reporting defects to the dispatcher.